You are receiving this message because you created an account on myBrainshark.com. As part of our recent decision to sunset myBrainshark, I wanted to remind you of upcoming milestones that will affect your access to myBrainshark. 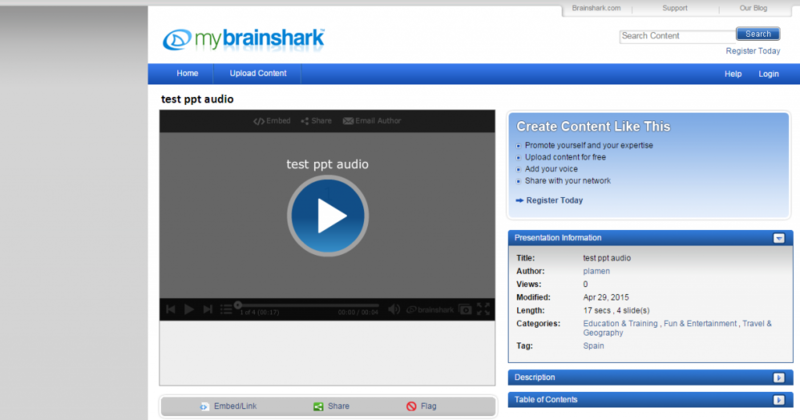 •	August 29, 2015 – No new uploads of content can be made in myBrainshark. •	January 4, 2016 – The myBrainshark website will officially shut down and all content will become inactive. While existing myBrainshark presentations will continue to work until the full site shutdown on January 4th, 2016, you may wish to work on updating those links in the interim. We recommend using this time to review all of the places where you’ve published these links as they will no longer function as of January 4th, 2016. •	Download your content or Publish to YouTube. We recently enabled two new features in myBrainshark to assist myBrainshark users in migrating from the platform. These features allow you to publish your presentations to YouTube or to download your content straight to your hard drive or cloud storage system. The period to download content will end with the myBrainshark shutdown on January 4th, 2016. We appreciate your loyalty to myBrainshark and apologize for any inconvenience this may cause you. We are committed to supporting you as best we can. You can find answers to the most common questions here. For additional questions, please don’t hesitate to contact us directly. Our team is dedicated to supporting you throughout this transition. You can export directly to .wmv from PowerPoint and put the video wherever you like. thank you for the addition, Peter!